The “Analytical and Monitoring” track at the recent “European Society for Animal Cell Technology” was notable for three presentations on advanced techniques based on the electrical capacitance of cells in media. At the conference, Katrin Braasch, a doctoral student at the University of Manitoba, presented data on five independent methods for determining cell density and/or viability. Her techniques include particle counting, image analysis with trypan blue exclusion, on-line capacitance, off-line flow cytometer apoptosis kits, and a novel dielectrophoretic (DEP) cytometer. Developed at U. Manitoba (Thomson and Bridges group), the DEP cytometer analyzes individual CHO cells through radiofrequency actuation in a narrow capillary. This technique, which relies on shifts in dielectric properties corresponding to loss of cell viability, is capable of identifying sub-populations of cells during apoptosis, which may be further characterized through fluorescence markers and capacitance. During the measurement with the DEP prototype, a cell suspension diluted in low-conductivity medium is passed through a microfluidic channel, where individual cells pass over an electrode array that detects and vertically displaces the cells. The degree of displacement directly relates to the cell’s polarizability, which in turn correlates with the cells’ metabolic health and viability. “Our results show that the various on- and off-line techniques gave similar values during exponential phase and that measurements diverged only at the point of highest cell density,” Braasch said. She found that the intermediate-stage apoptosis assay agreed with data from the bulk capacitance probe, while early-stage apoptosis measurements correlated with the DEP cytometer. Both bulk capacitance and DEP cytometry allow for earlier detection of apoptosis than trypan blue exclusion, the standard apoptosis assay in use today. Earlier detection prompts investigators to harvest at that stage, or alter the feeding strategy to extend culture life. DEP allows Braasch to map the trajectory of viability in CHO cells, including identifying subpopulations associated with various stages of apoptosis, and to distinguish viable from nonviable cells. It is also possible to identify subpopulations of apoptosis in a bioprocess using flow cytometer assays. However, flow cytometry assays are expensive and time consuming because of incubation times required for staining protocols. DEP works without staining. Despite the trend toward online and inline monitoring, offline methods such as cell counting, and at-line semi-automated techniques still dominate biomass detection. Yet both approaches are time consuming and are incapable of monitoring a process continuously. One emerging “electrical” technique, radiofrequency impedance (RFI) detection, is capable of in situ viable biomass detection and is well established in biopharmaceutical processing, but only in traditional glass and stainless steel bioreactors. RFI detection exploits the fact that healthy living cells act like electrical capacitors, accumulating then releasing electrical charges. The phenomenon applies to both suspended and attachment-dependent cells on microcarriers. “Compromised cells lose that capacity,” Dr. Carvell told GEN.
RFI detection correlates well with trypan blue staining until cells begin to enter their death phase. Several recent papers explain the differences between RFI and standard live-cell counting methods. The Aber sensor matches the Guava ViaCount assay during the death phase, but detects the onset of apoptosis earlier than the trypan blue. So which test is more accurate? “Unfortunately, there is no gold-standard test for live-cell concentration,” Dr. Carvell explained. Carvell’s work becomes increasingly important as more processes become “born and bred” in plastic. The RFI probes must be compatible with single-use equipment’s agitation, aeration, and capacity for gamma sterilization, and work through signal fluctuations due to variability of liquid level (particularly in rocking bio-bags). Cost must be reasonable as well, since the probes are disposable. The Aber probes consist of four annular ring electrodes that monitor current and voltage inside the culture. In the absence of cells, current and voltage are in synch. Due to the nature of capacitance, as cell density increases, voltage and current become out of phase. Only living cells containing a conducting cytoplasm enclosed with an intact nonconducting membrane are polarized under the electric field, which is how RFI distinguishes between living and dead cells or debris. While it may be novel for bioprocessors, RFI detection is not a new technology. Many such systems are installed in breweries across the United States to allow accurate yeast dosing at the beginning of each fermentation. A team led by Lisa Graham, Ph.D., senior VP at Bend Research, is exploring the capabilities of using scanning multifrequency dielectric spectroscopy (SMFDS) to profile multiple bioreactor runs and quantify cell viability. Dielectric spectroscopy measures the capacitance, or charge-storing characteristics, of samples across a spectrum of frequencies. In the case of cells, this charging happens via a phenomenon known as Maxwell-Wagner polarization, which occurs because of the nonconductive nature of cellular membranes. Dielectric spectroscopy takes advantage of this characteristic by treating electrical measurements from cells in media as if they were an electrical circuit. The number of capacitors (cells) and the properties of the dielectric comprising them (size, morphology, ion content, membrane composition) affect the shape of the dielectric spectrum and can, therefore, be measured. The group at Bend Research has resolved multiple cell populations within the context of apoptosis. Other groups, Dr. Graham said, have reported changes in cell populations associated with metabolic changes, cell size, membrane composition, and cell morphology. Managing and interpreting process data generated during development can be a major bottleneck in deciding on key quality attributes. Electronic laboratory notebooks (ELNs) and laboratory information management systems (LIMS) fall short on several fronts. Although meta-tagging and collaboration are common components of modern ELNs, the software essentially creates electronic versions of paper documents. LIMS, on the other hand, are primarily for sample tracking. Hans Peter Fischer, head of Genedata Biologics, described a new approach to managing the data deluge during development. Genedata Biologics™, part of the Genedata software suite for life sciences research and development, is an enterprise system that supports biologics R&D from inception through development-stage analytics, production, and purification. 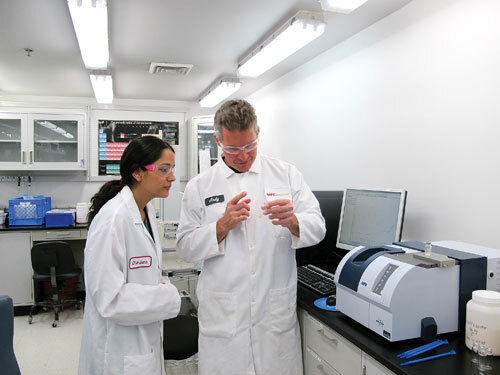 Like more familiar laboratory software, Genedata Biologics directly connects with analytical workstations and automated monitoring equipment, at scales ranging from shake flasks to 200 L bioreactors. Genedata also helps developers uncover trends. For example, during a development project a team may wish to optimize expression levels of three different CHO lines based on media, feed, transfection protocol, and culture time. “Our system provides a systematic, structured way to store data collected during development of your three different cell lines, and then systematically compare product quality based on key analytics. Everything is tracked,” Fischer reported. The conditions and quality attributes may then be applied during scaleup. One can construct a decent argument for monitoring bioprocesses at the raw-ingredient stage. That idea is part of an initiative at SAFC, begun in 2009. The company’s Raw Material Characterization (RMC) program seeks to screen raw materials analytically and biologically, and to do so rapidly using near-infrared (NIR) and Raman sensing devices. Principal scientist Chandana Sharma, Ph.D., notes that investigators may then employs multivariate analysis to uncover spectral properties that correlate with quality attributes in culture medium as well as raw ingredients like plant hydrolysates. Rapid spectroscopy generates spectra which, with the proper analytical approach, can generate quality “signatures.” But they cannot pick up trace components. So, in addition to rapid methods, Dr. Sharma’s group employs more traditional ultra-high performance liquid chromatography-mass spectrometry (UHPLC-MS) to probe deeper into suspected quality issues for which Raman and NIR serve as screens. SAFC’s raw material characterization program encourages the screening of raw materials using near-infrared and Raman sensing devices. Process analytic technology implementations have been slow to achieve real-time analysis and monitoring for high-level parameters such as protein titer and host cell contaminants. These critical parameters are typically analyzed by HPLC or sandwich-type assays, both of which are time consuming and, even in automated formats, prone to human error. Uppsala Sweden-based Gyros has introduced the Gyrolab™ xP, which miniaturizes, standardizes, and automates up to 112 sandwich assays and delivers results in about one hour. Gyrolab enriches monitoring from discovery through clone selection, media and process development, scaleup, and manufacturing. The system is based on an automated liquid-handling system that uses eight needles for sample transfer and two for reagents. Instead of running the assays in plates through sequential addition of reagents, the analysis cassette consists of a compact disk (CD) containing 112 microchanneled analysis pathways, including a 15 nL streptavidin bead column. After samples are introduced, the CD spins and samples move through the channels and column through centripetal force. When the assay is completed, a robotic arm moves the CD to a reader, which generates the result.